Imagine that you’re a customer walking into an office, ready to sign a big contract. Then you notice a huge coffee stain on the carpet, and then another. As your eyes wander, you see shoeprints, dirt, food. How likely are you to value this shop, either as a customer or a potential partner? The carpet is the first thing a customer sees when they enter your business. And it should look its best at all times. Clean, well-maintained carpets gives a positive impression of your business as a whole, while also providing a healthier and more pleasant indoor space for your guests, reflecting the pride and attentive care you feel not only for potential clients, but for visitors, occupants and staff. Regular cleaning also extends the life of the carpet, allowing for significant savings in the long-run. Having an effective carpet maintenance program takes planning and commitment. The proper equipment and supplies, combined with regular training, will help ensure the carpets look clean and attractive, last longer, and promote a healthier indoor environment. Using our three-step system, we can guarantee an affordable and efficient way to care for your carpets, so that you can deal with the smaller messes before the big ones. Portable extractors are a must for removing spills and spots before they become stains. While these come in a variety of sizes, the smallest are handheld and easy to use, containing three tanks for cleaning solution, a recovery tank for the dirty solution and a clear rinse water. Larger extractors have larger-capacity tanks for cleaning solutions and accessories, such as hoses and wands. These machines can be used for cleaning entrances and eating areas, such as lunchrooms and break rooms. Vacuuming is the easiest and most efficient way to keep your carpet clean. Where a wide-area vacuum is not practical, smaller upright vacuums, carpet sweepers, stick vacuums and backpack vacuums can take over, allowing for ease of use in crowded, furniture-filled spaces. Water vacuums are invaluable in situations where large amounts of liquid need to be cleared off the floor, quickly and without injury. Carpet Care Systems’ hot injection/extraction technology with encapsulating cleaning chemicals eliminates the toughest dirt and residue from thick carpet. Three-dimensional cleaning guarantees that the product loosens and remove the soil, and prevent the stain from coming back. Cleantech Gulf provides several types of equipment for Carpet Care and various options for residue free shampoo, fast drying and stains removal. Deep clean stains and odors in carpeting with Xtreme Power's heavy duty, deep cleaning carpet extractors and remove surface stains and odors with interim carpet extraction. Xtreme Power’s full line of carpet cleaning equipment gives you a variety of options and maximum flexibility to clean in large or small spaces. Power sprayers are a great way to remove really stubborn stains. By pre-spraying cleaning solutions in high-traffic spots, they prep the ground for an easier stain removal. They can also be used after cleaning and extraction to apply soil-retardant solutions, anti-static agents, deodorizers, odor neutralizers and flame-retardant chemicals to a large area. Steam-vapor cleaners are another unstoppable hero. Injecting steam into the carpet, the cleaner then blots out the stain. These small, portable machines combine high heat and low moisture to clean and disinfect spots and soiled areas on carpet and hard surfaces. For smaller stains, a vital element of any carpet-care program is a spot kit for the small stains that happen on the sly. Kits come with cleaning chemicals designed to remove soils and stains, a spotting chart for cleaning crews to identify the best removal techniques, and a general spotting agent. 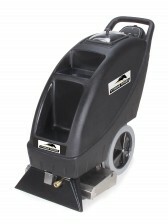 Cleantech Gulf provides right equipment for carpet cleaning in mosque.